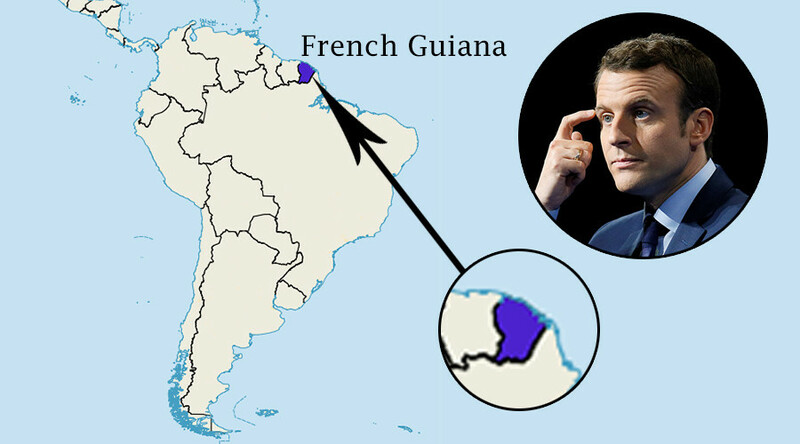 French presidential candidate Emmanuel Macron has made a geography gaffe, mistaking the country’s overseas territory French Guiana for an island, leaving netizens in a tizzy. Macron, who is on a tour of France’s overseas territories, expressed concern over the escalating tensions caused by a general strike in French Guiana on Monday. “What’s been happening in French Guiana over the past few days is serious. My first response is a call for calm, because blocking the airport runways and takeoffs – and sometimes even blocking off the function of the island itself – is not the response to the situation,” Macron said. In fact, French Guiana, one of five French overseas territories, isn’t an island at all, but part of the coast of South America and the second largest region of France. Journalists didn’t seem to pick up on the mistake at first either, but the gaffe was later lampooned in the French media under headlines such as: “Macron and Guiana the ‘island’” and “Macron and his blunder”. Le Parisien even published a quiz so that readers could find out if they knew French geography better than the presidential candidate. The Internet went wild, too. “[The French] Guiana by Macron,” one tweet said, adding some (ir)relevant pictures. — 🃏 FouFou 2017 🃏 (@20RueduCirque) 26 марта 2017 г. "It’s you Macron, who is a grave [situation]! You want to be the president of our country, and you think that Guiana is an island! Our French [citizens] of Guiana will be pleased,” another user wrote in the comments below the YouTube video showing Macron making the mistake. “He wants to become president... Go learn some geography first!” another user posted on YouTube. Another Twitter user posted a photo of Macron supposedly searching for French Guiana on the web with a cover of Jules Verne’s ‘Mysterious Island’ posted just next to it. — Purée Muslim † 🐸 (@PureeMuslim) 27 марта 2017 г. People also recalled previous mistakes made by French government officials. “With Hollande we found Macedonia, with Duflot Japan in the southern hemisphere, with Macron Guiana island,” a user tweeted. — Elisaou750 😈 (@elisaou750) 27 марта 2017 г. Earlier, French President Francois Hollande made some gaffes too, paying tribute to the “Chinese people” during a visit to Japan and saying France “has taken note of the situation in Tunisia” when questioned about Egypt.